Vice President, Sales & Biz Dev at Company.com Corp.
Over the course of his career, Kevin has consistently place in the top 10% on multiple enterprise sales team, introduced structured sales methodologies and strategies to his teams, and has been successful taking companies from startup to multi-million dollar run rates, building and managing cohesive teams and strategic partnerships along the way. Before joining Company.com, Kevin was Senior Vice President for the Commercial Payments division of Goldleaf Financial Solutions. At Goldleaf, Kevin led the turnaround of a troubled business unit, moving from negative growth in revenue and client acquisition to a 25% increase in fee income, a 50% drop in client attrition, and 30% increase in distribution channels.Previously, he served as National Accounts Director for Kaplan EduNeering, a leading provider in enterprise knowledge management, compliance, and human capital performance solutions. At EduNeering, Kevin managed 18 major accounts in life sciences, Federal government, and US military. Prior to his tenure with Kaplan, Kevin was a member of the inaugural sales team for Percussion Software's family of enterprise content management solutions. 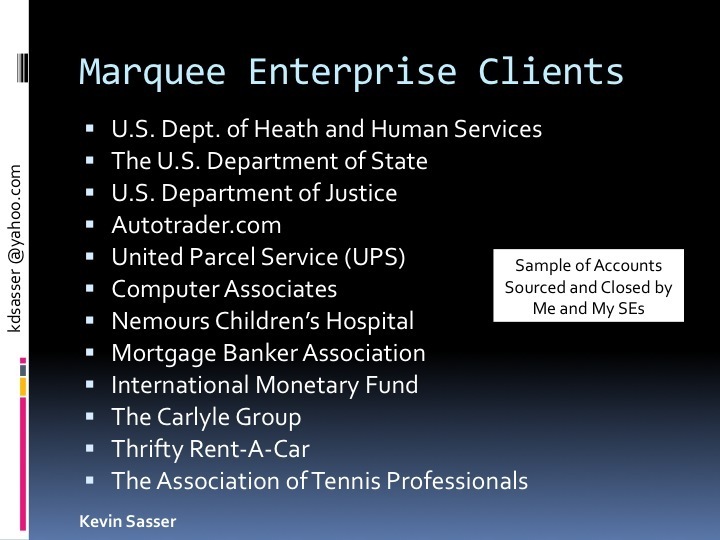 Starting with zero, and competing against IBM, Microsoft, and Oracle, Kevin and his teams led Percussion in new license and professional services revenue in four out of five years, established a robust Federal Client practice, and bought over 25 marquee accounts onto the platform.Earlier in his career Kevin worked extensively with banks and other financial institutions in the areas of internet banking, backoffice software, and electronic payments.Today, Kevin enjoys working with cutting edge companies and advising technology and social media startups. Company.com is a new enterprise social network designed to help companies to more effectively communicate and collaborate with internal and external audiences. While the company was still in stealth mode, Kevin was the first person hired in the Company HQ and reports directly to the CEO. In this entrepreneurial environment he has led multiple initiatives related to driving new revenue, forming new strategic partnerships, and scouting potential acquisition targets. Sourcing and making introductions to Google and working across divisions to engage with Google's advertising, affiliate marketing, and social networking groups. Negotiated dozens of advertising contracts with companies such as Experian, iContact, Phone.com for CPC advertising within the Company.com network. Member of senior executive team responsible for driving revenue by targeting, recruiting, and managing relationships with strategic partners, channels, advertisers, and potential acquisition targets. Privately-held, Percussion provides enterprise and web content management solutions to the Fortune 2000, State & Federal Government, and Non-Profit verticals. When I joined the company in 2000, web content was still new in the market and the dot com bubble was just showing its first signs of cracking. Six months later, our entire dot com practice was wiped out and a few months later 9/11 occurred. Our team hung together and targeted the federal space. Twelve months later we had two major agencies on the client roster and a few years later the federal practice was generating over $5mm annually in revenue. Over the course of a nine year career, played key roles in helping grow business unit from startup to market leader in five years. Starting as an entry-level customer support representative, Kevin was promoted numerous times becoming a sales engineer, marketing manager, public speaker, and bank consultant, before finally becoming one of the top producing regional sales managers for Equifax's suite of eBanking solutions. Kevin is the consumate salesperson - he is very professional and well informed in his industry; he does excellent and humorous presentations that are well suited to his banking CEO audience; he represent his company as an expert, and builds relationships because he is well liked and low key, a consultant personality. Kevin is someone whom I would work for, work with, and assist at any level. With a degree in computer science, my whole career has been invested in the technology field. Starting in the 90s with selling DOS-based systems to today helping driving new subscribers to a new social media network, I am extremely proficient in enterprise software. I have experience with three startups, helping to take two from the ground floor to multi-million dollar run rates. In my latest experience, I am a member of the executive team with direct responsibilities for the P&L. Starting with a virgin territory, my teams and I built a Federal practice that included Five major agencies; Dept of State, Dept of Justice, Library of Congress, Dept. of Health and Human Service, and Office of Personnel Management along with 10 sub-agencies. Managed numerous team ranging in size from 2 to 15. In-field management includes six years of managing inside sales, sales enginners, and professional services members. In-house management includes managing up to 15 inside sales team members and the P&L for multiple business units. I closed my first deal in 1991 for a total of $300. My largest closed account generated over $6mil for my employer over three years.